atouvap.fr • Consulter le sujet - LES BONS PLANS de HEAVENGIFTS en AOUT ! Digiflavor this time works with RiP Trippers to come up with a new dripper tank which was released recently, named as Pharaoh 25. This is a RiP Trippers's project, it is produced for cloud chasing. You can instantly tell this purpose from its 25mm diameter.The clamps deck design of Pharaoh 25 definitely is a good news for vapers who prefer coil builds, a spring loaded clamp could fix any shape of wires. The 25 diameter sized tank gives vapers enough space for rebuilding. Pharaoh 25 comes with a slip plate which can be rotated to control the juice flow and the wicking, a very ingenious design. Besides, it features a triple bottom airflow holes, which ensures the air goes straight to the coils. Plus its anti-spitback drip tip, Pharaoh 25 is the one worth of your trying. Use "AHGEVAPE" code to get an extra 8% off discount. Eleaf just release two entry-level vape gears that adopt a super tiny size and all-in-one design, named as iCare and iCare mini. They both almost share the same features. With a built-in tank design in a remarkably small size, the new iCare and iCare mini are quite convenient to carry and hold in hand. They are quite simple to use for the automatic On/Off feature that initiate when vaping. They also come with easy top filling, adjustable airflow and visible window for checking e-liquid level. Also with intuitive three color LEDs, you can easily check the battery status by a simple glance at the color of the light. The most difference between iCare and iCare mini should be the battery capacity. iCare is 650mAh, while iCare mini is 320mAh. However, the iCare mini comes with a sustainable iCare mini PCC of 2300mAh battery capacity to charge it, which means longer battery life for your daily use. Now you can pre-order these two devices at heavengifts.com. Use our 8% off code "AHGEVAPE" to get iCare at US$12 and iCare mini at US$21.9. Repéré hier sur le site.... va pas tarder à tomber dans le panier celui là !!! The vision of Vapeonly is to build a tar-free world for all the vapors. The goal of Vapeonly is to provide better electronic cigarette products with high technology and fashion design. With many years researching in this industry, Vapeonly has accumulated rich experience and knowledge on combining green material, pioneer technology and user-friendly design together and creating the best product. 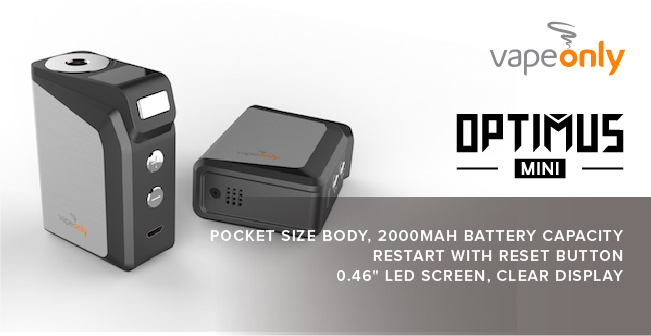 Vapeonly has been engaged in developing a compact sized mod with excellent performance. Now, time to introducing you its lastest mods—Optimus Mini Mod and Lancer Mod. Optimus Mini is an exquisitely designed, small and very portable electronic cigarette product.A LED screen is added to the top of the device, direct display and easy operation. A small body with 2000 mAh battery, provides you long time vaping experience. 2.Pocket size body, with trong power. 2000mAh large battery capacity. 4.0.46" LED screen, clear display. 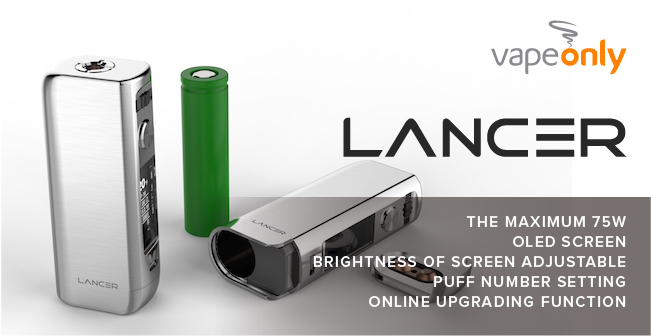 Lancer is an exquisitely designed, modeling concise, rigid-flexible, hand feeling comfortable and high quality electronic cigarette product. It supports temperature and VW modes; also Ni200, SS316, Ti, Cr, etc. Lancer is a superior MOD which you deserve. 1.The maximum output power is up to 75W. 4.Puff number setting, vaping amount warning available, could be a smoking quit help, and leads to better vaping habits. 5.Online upgrading function is added, to check version information and to upgrade system. These mods feature a super compact sized body meanwhile don't lost any vape performance. Plus affordable prices, they are the ones you cannot miss.